On the way home from the library yesterday, I asked the kids what they wanted for dinner. 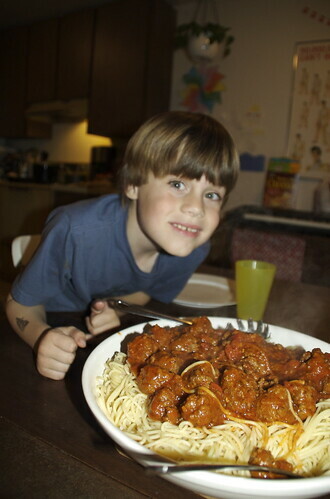 My Man B answered first (or at least loudest), with Spaghetti And Meatballs! You’ve never seen a kid run so fast to get his hands clean — I’m thrilled to have a new trick up my sleeve to get the kids cleaned up, and get out of doing all the food prep! I have no idea if this picture makes it look appetizing to others, but I do know that we enjoyed one of our best meals in a long time. I’m happy to share the recipe, but we really just kinda made it up as we went (nothing too weird other than wasa bread pulverized to substitute for missing bread-crumbs…).